I play a lot of video games and I can say with near absolute certainty, that Electronic Arts is the king of monetizing downloadable content (DLC). Just today I learned, via Kotaku, that Madden 11 will offer the ability to scout your online opponents. Are you kidding me? 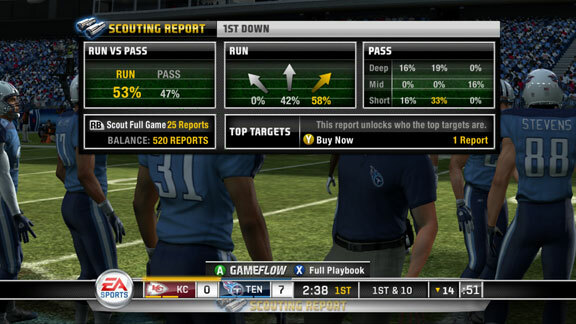 I don’t play much Madden anymore, not since Madden 2009 where you’d just have Randy Moss run a fly route every play, but the idea of online scouting reports is really cool. Until you realize it’ll cost you “coins.” You can earn coins for playing and completing online games or you can buy them. While it’s not known how much each report is (there are 50) or how much they cost, you can be sure die-hard players will be willing to pay for these coins. Say what you will about EA and their DLCs (people were pissed at how expensive the first Modern Warfare 2 DLC was… then 11.1 million people paid for it), but they have figured it out and are making bank. Oh and the best part about the scouting? You know when your opponent has scouted you. You should have stopped playing Madden long before. I used to just use Culpepper to Moss fly patterns with the Vikings back around 1999 and 2000.